October is National Breast Cancer Awareness Month. During this time companies often create specialized products to help raise awareness and funds needed for research and ultimately a cure. Citizen Watches recently launched a gorgeous new watch who proceeds will go to support the Susan G. Komen for the Cure foundation. 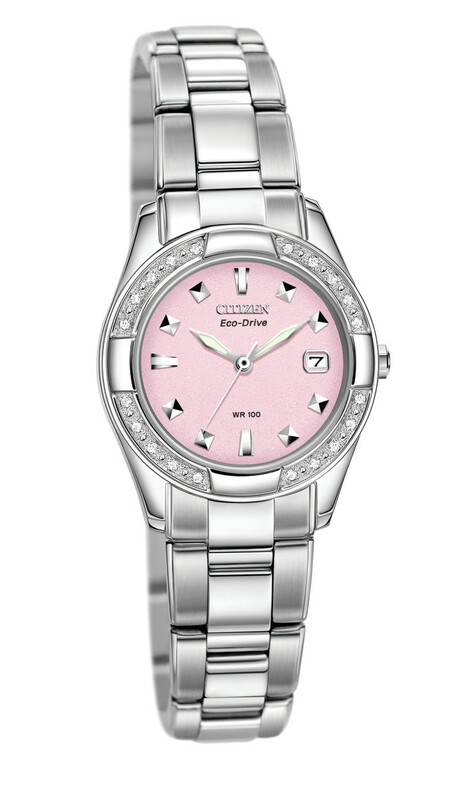 The Citizen Eco-Drive women&apos;s watch features a cute and delicate pink dial, a 20-diamond bezel, sapphire glass and stainless steel bracelet. It&apos;? ?s also powered by light (using Citizen&apos;? ?s Eco-Drive technology) so it never needs a battery and it&apos;? ?s water resistant. Through this campaign, Citizen has donated a minimum of $100,000 in 2011 to Susan G. Komen for the Cure, partnering in the fight to save lives and end breast cancer forever. The watches are available where Citizen timepieces are sold. For additional information, please visit www.komen.org.